I’m interrupting your regularly scheduled programming with an updated calendar of events for TheKentuckyGent.com. With the new year quickly approaching I’m going to be taking the site in several new directions. All designed to make your experience on here more enjoyable, more reliable, and constant. My Out N Lou posts will now go live on Thursdays to give more advanced notice of what I’ve got my eye on for the weekends. Also, to help streamline the site’s content stream beginning in the new year my weekly calendar will break down something like this: Monday, Wednesday, and Friday will be a traditional outfit or styled post; Tuesday I’ll share my tip for the week, whether that be a recipe or how to be a better blogger post; and like I said earlier Thursday will now be all about Out N Lou. As you’ve heard me say time and time again I’m dedicated to constantly expanding and bettering what I do, and I think this is a step in the right direction. If you’ve got an feedback about these changes, whether that be negative or positive, please drop me a line, I’d love to hear from you. But without further adieu here’s how to be Out N Lou this weekend. Start your day off with a Serial Listening party at Please & Thank You at 9 a.m.
You can get a peek at the new season of Downton Abbey at one of KET’s free preview events at The Kentucky Center. Support the Coalition for the Homeless’s RX Housing Program at their 4th Annual Give-A-Jam from 6:30-11:00pm at the Clifton Center. Bring some friends, grab some drinks, and play some trivia for Great Flood Brewing Company’s Thursday Night Trivia. Join Light-Up Louisville to experience the tradition that has spanned three decades for thousands of residents and visitors to our city from 6 p.m. – 11 p.m.
Get into the Holiday spirit with The Brown-Forman Nutcracker and The Louisville Ballet at The Kentucky Center for the Arts. Jalin Roze performs with Bird Zoo, 1200, Skyscraper Stereo, and Dr. Dundiff at Headliners Music Hall. oin West Sixth, Forecastle Foundation and Mercury Ballroom on Friday to get in the holiday spirit with Care-Aoke Christmas at the Mercury Ballroom. Start your Friday night off with a bang at Apocalypse Brew-Works’ Food Truck Winter Party. Satisfy any kid in your life, or that kid on the inside, by having Breakfast With Santa at The Galt House. Trampled by Turtles performs with Nikki Lane at Brown Theater. Hang out with Alex Bell at 8UP Elevated Drinkery & Kitchen’s Hang Up Saturdays starting at 10 p.m.
Don that ugly sweater and join Garage Bar for their 2nd Annual Ugly Sweater Brunch. Drown your sorrows, that the weekend’s almost over, with a $2 Mimosa and Bloody Mary Bar this and every Sunday at Tin Roof Louisville. Never a dull moment in town as most of y’all know by now, but as always this is just a quick roundup of some of my favorite picks for the weekend. If you think I’ve missed something, or if you have something that you’d like me to add for next week’s post let me know! 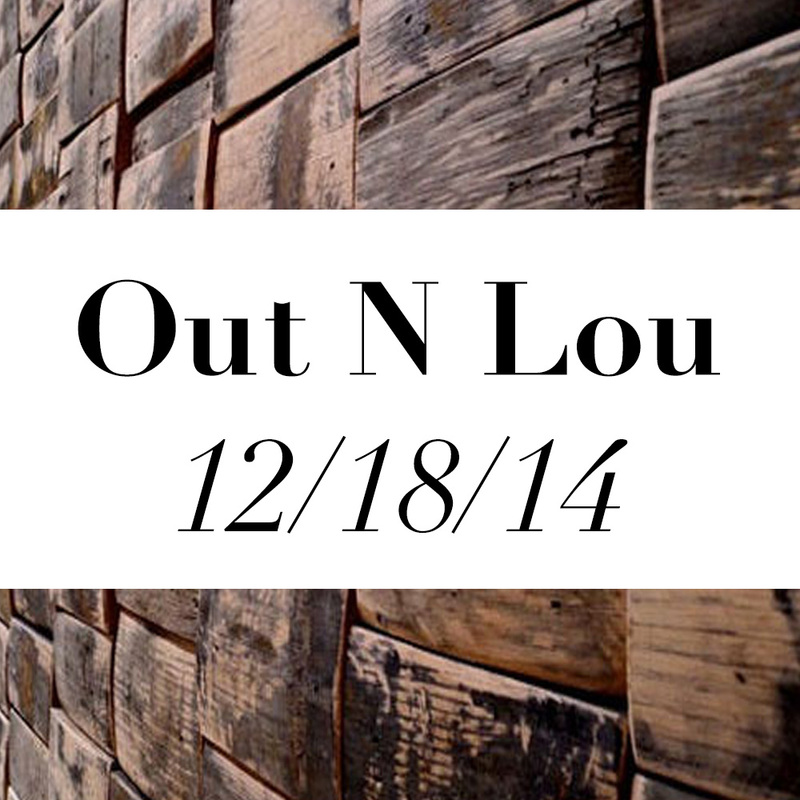 Keeping tagging along and tagging your photos with #OutNLou to share your weekend adventures.